They say good things come in small packages and this is certainly the case for pint sized Meysi. 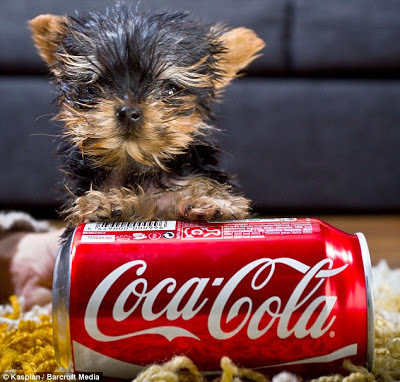 This tiny terrier is only 7cm tall, 12cm long and weighs just 150g! She could be easily mistaken for a hampster and is about equal to the size of a coke can. Meysi is 16 times smaller than all of her siblings and was even nearly thrown out at birth after her owner mistook her for a piece of placenta and almost put her in the bin. It was a battle to keep her alive after birth, but 3 months on and she is strong and healthy with a typical terrier character, according to her owner, Anna Pohl. Meysi has to be at least one year old before she can claim the title of world's smallest dog in the Guinness Book of Records, so until then the record sits with Boo Hoo, a chihuahua from Kentucky. Vets say she won't grow much more so it is safe to say shes in with a big chance.